[The report] is practically a laundry list of my governmental pet peeves. The groups share my contempt for corn ethanol, “the granddaddy of wasteful alternative fuels,” as well as farm subsidies in general and a particularly egregious giveaway to Brazilian cotton farmers in particular. They also tee off on my favorite bureaucratic target, the Army Corps of Engineers, singling out my favorite Corps flood-control boondoggle, my favorite Corps lock expansion boondoggle, and an equally egregious Corps boondoggle that I don’t even joke about, because it’s wasting more than a billion dollars just a stone’s throw from the flimsy Corps levees that failed during Hurricane Katrina. We’re also on the same page when it comes to the nuclear industry’s cradle-to-grave government support, as well as those ridiculous rural airport subsidies that Congressman John Mica took hostage during a recent standoff with Senate Democrats over FAA funding. Unfortunately, the hostages didn’t get shot this time. Green Scissors is an amalgam of liberal, conservative, and good-government groups, and you won’t likely agree with every one of their recommendations. But after skimming through the report I found a lot to like. They claim to have found $380 billion in wasteful spending over five years, and even if only half of their recommendations are worthwhile that still amounts to nearly $40 billion per year. The entire report is here. 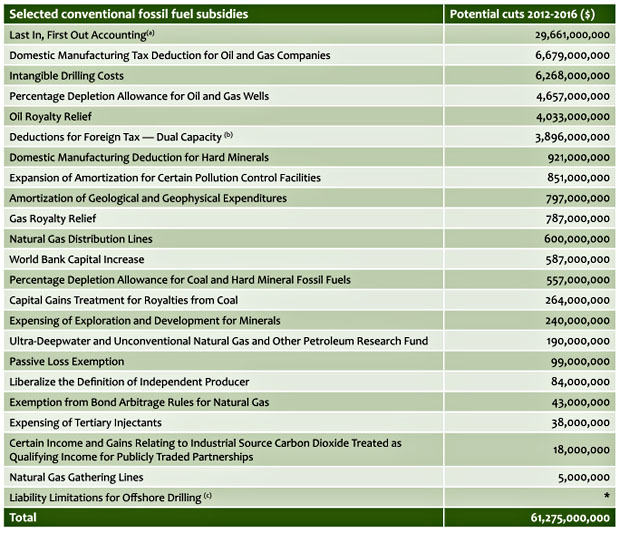 The table below shows just their targeted cuts in fossil fuel subsidies. They’ve also got sections for nuclear energy, alternative energy, agriculture, transportation, and land management. Bon appetit.